Investment in horses and in particular breeding of horses is financially and emotionally an expensive venture at the best of times. It should not be entered into lightly without consideration of the possibility of factors out of our control playing havoc with the best laid plans. Breeding is a game of juggling genetic possibilities and we endeavour to produce the best foal possible my matching stallions and mares for their physical, mental and proven or potential capabilities to create a horse to meet whatever the breeder’s vision into the future may be. What of the invisible ingredients in our mix? The genetic codes that actually create our foal, the map that really charts the creation and engineering of everything the horse breeder sets in motion. Mostly we apply our best skills as a judge of those horses in our various fields of expertise and then cross our fingers perhaps confident we do know what the mix will create but praying nature does not have a hidden agenda. Which she does. Genetics and nature are a fluid part of evolution; essential to the survival of any species is diversity created by selection of genetic codes carrying changes. Sadly not all those genetic changes have a role that meets the needs of the species and some are just outright destructive. These we tag as ‘Genetic Disorders’ and generally thank whatever we believe in that they mostly only manifest occasionally. But even that is just an evasion of facing the truth. The Hispano-Árabe, while essentially an old established breed dating back hundreds of years (as previously discussed to the days of the Moor invasions of the Iberian Peninsula) is undergoing a breed preservation and regeneration programme which by necessity means the introduction of genetic codes from new sources. Specifically the increase of new Arabian blood lines and with the modern world diversification of Arabian ‘types’ a far greater range of genetic phenotype (physical characteristics); all of which in the last 30 years the Spanish Hispano-Árabe Stud Book has taken into consideration in developing its grading and testing of the ‘new’ Pure Bred Hispano-Árabes. The probability of the manifestation of these disorders within Pure Arabian breeding programme is higher than in its partbreds (generally) as the chances are that the carrier partbred horses are less likely to be bred back to other carriers. But the Hispano-Árabe is not a partbred, it is a derivative breed and our F1 (PRE x Arabian) are bred back with other F1 stock and by the very fact that the breed is critically low in number the incidence of manifestation of the transmitted Arabian genetic disorders is as high a probability (if not higher) than in the Pure Arabian. The decision to test or not for these disorders (where testing is available) and then to breed or not (when tested positive as a carrier) has been left to the integrity of the Arabian horse owner. So in effect while some breeders elect to endeavour to eliminate genetic disorders from their breed programme, others elect to continue breeding. They consider the odds for now might be in their favour with limited losses of foals from the devastating consequences of these disorders but they ignore the future when their action has resulted in the compromise of all Arabian horses as the number of silent carrier’s increases. The Hispano-Árabe breed protection programme is barely in the gateway in its development. It would be devastating if the work of the past 30 years to protect this breed was to be shattered for want of a moment’s consideration before breeding. If we view our-selves competent to breed horses then we should have the integrity to think not just of our short term desires but of the long term consequences of our choices and decisions. The Spanish Government has taken stock of the implications of the introduction of Arabian breed specific genetic disorders being carried into the Hispano-Árabe breed and accordingly the Ministry on 18 June 2012 amended the Hispano-Árabe Breed Rules to adopt measures to deal with this. Details of these measures will be published as soon as I receive exact copy. However, there is no reason on earth for Hispano-Árabe horse breeders to not exercise common sense. Check the Arabian horse you intend to breed from. If it is a carrier : Don’t breed! It is in the interests of both the Arabian and the Hispano-Árabe owners to ensure before breeding that the Arabian horse is tested clear of those disorders we have tests for. The CA and LFS disorder tests are available at most laboratories carrying out equine DNA testing so owners can shop around for best prices and labs they feel suit their needs. Hispano-ÁrabeUK uses Animal Genetics Uk for our DNA testing and this lab apart from being sensible on costs provides a superb service for horse owners. A little thought and integrity and there is no reason for the worry that maybe all your hopes and plans for a perfect foal are going to be shattered. A bit of consideration for the future and the integrity to not breed if a test is positive and you will not be the founder of the future destruction of the lines of horses you elected to contaminate. Hard truths but better to swallow than to stand beside a foal in distress dying because you crossed your fingers and hoped! Translation of text written by: Laura ÁGUEDA (this article was published in 2010 as part of the promotion of the breed within Spain and to bring into the Stud Book existing horses that had previously been missed out at the start of Spain’s Hispano-Árabe breed protection and regeneration plan). The idea of ​​improving the characteristics of the Spanish horse with Arab horses came from within the Military Stud in 1883, with the primary objective of providing greater versatility for the first military campaigns. What better way to start this portrayal of the Hispano-Árabe horse than by quoting Don Alvaro Domecq y Díez from the preface in the book The Horse in Spain: "The Spanish horse crossed well with the Arab and achieved a masterpiece, the Hispano-Árabe, which relieved the race and provided more speed without losing an iota of arrogance." But why did it take so long to make, at least consciously, this crossing, when the Arab has been used since antiquity to improve other breeds? It has historically been the blood that has improved most of the breeds of the Western world. In the eighteenth and nineteenth centuries the need for fast and light cavalry lead to a requirement for the Arabian horse, to go back to the origins of all warm blooded horses; to offset the heaviness and slowness of the calmer temperament breeds, giving rise to new breeds such as the French Thoroughbred riding horse or English Thoroughbred. Believe it or not, in the Iberian Peninsula the relationship of the Andalusian horse or Spanish to Arab came quickly. During the conquest of Al-Andalus, the horse used in the raids by Berber tribes who rode from North Africa was the Barb. This probably explains the great similarity of the one with the Spanish horse, but not so much resemblance with the Arab, the horse in the Middle East. Not until the late nineteenth century when, thanks to the initiative and the good work of the military, buying commissions were created to travel to the places of origin of the Arabian horse and there buy the best specimens to improve the national herd. The same happened in other countries like England or France. The search of the Arabian horse by Spanish soldiers in some of their home countries, Turkey, Syria, Mesopotamia and Palestine, is beautifully reflected as if from a travel book in Search for the Arabian Horse by Cavalry Commander Luis Azpeitia de Moros (1905). The idea of ​​improving the characteristics of the Spanish horse with the Arab horse was therefore conceived within the Military Stud in 1883. Its primary objective was to provide greater versatility for the first military campaigns: functionality and athletic features in the Arabian horses would be sought for seven months by Luis Azpeitia de Moros and his fellow military commission created ad hoc to complete this mission headed by the Commander of Cavalry Agustín de Quinto. "On May 13, 1905, and pursuant to the loyal order of 1st of that month, I left Madrid in the direction of Marseille, accompanied by Administration Officer Mr. Fernández and second, Military veterinarian Mr Viedma, who were part of the Commission for the purchase of livestock in the East, "says Luis Azpeitia de Moros in his book in Search of the Arabian Horse. Years ago, in the late sixteenth century, there was a phenomenon the reverse of that describe now in this article. At that time foreign blood was introduced, but looking for a type of horse for its form/physical build and functionality was not the significant factor. 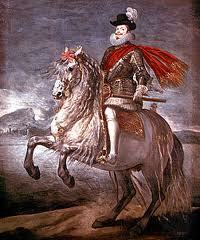 The monarch Philip III appointed a Neapolitan director of the Yeguada de Córdoba, Lieutenant Tiutti, and in this matter to import foreign stallions to provide the Spanish horse with greater bulk to make it more suitable for driving large carriages as had become fashionable in Italy. But the Pure Spanish horse was a riding and shooting, saddle horse, and to gain in volume lost it the agility and beauty. Equestrian portraits by Velázquez are good examples of this. However, before this process of "improvement" of the Spanish horse, you can sense from the features derived traits that may indicate some kind of genetic cross with Arab. 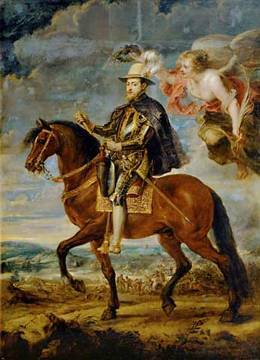 So the horses on which Philip II and the Duke of Lerma were painted by Rubens are light but strong animals with finer necks and small heads. In any case, what is always sought in the union with the Arab is their strength and versatility. Breeding with the purebred Spanish horse would result in a more lively and lighter horse than this; slim and fine while tough and strong, the main character traits are its reliability and nobility, and what stands out above all else are the virtues of functionality. For its hardiness and resistance this is a horse suitable for field work disciplines as well as close contact work such as Acoso y Derribo, el Rejoneo o la Doma Vaquera, where it can display its own features of speed and agility. It is also ideal as an animal of leisure to enjoy the popular festivities, associated with the corralling of bulls and wild cattle, still held today in many towns of our country. In all the ways mentioned, the rapport of the horse with the rider is paramount and the Hispano-Árab is in this sense a singular horse, which submits and obeys without hesitation when ridden, or at least when ridden wisely. He has also done well from this coupling of Arab and Spanish. And his strength - we must not forget developed in the extreme conditions of the desert - is proving to be a horse that when well-trained may be optimal for endurance. But also some specimens compete successfully in disciplines such as eventing, jumping or dressage. In the end the temperance and arrogance of the Spanish as well as their body mass, coupled with the strength, elasticity and beauty of the Arab make the Hispano-Árabe a horse worthy of being taken into account. The historical antecedents of the Hispano-Árabe beyond the possible crossing of blood due to chance, that has been able to make its mark in equine specimens showing many morphological traits of character of both breeds from long ago, dates back to the late nineteenth century. With the creation of Yeguada Militar (the Military Stud) by Royal Order 26th of June 1893, under the rule of Queen María Cristina, in the Dehesa of Moratalla (Córdoba) it was intended to: get products to nurture the deposits of stallions; producing bloodstock chosen to serve for farmers to regenerate their herds; testing crossings - such as the Hispano-Árabe; and rebuild the Purebred Spanish horse ... The seventy-eight mares that were originally on the roster of Yeguada Militar were distributed in the following sections: Purebred Spanish, Hispano-Árabe, Thoroughbred, Anglo-Arab, Hispano-Norfolk and Hispano-Percheron, and most of them were donated by breeders and owners of the time. As Spring arrives and new foals appear, please ensure that if you have bred a Hispano-Árabe foal; that you send the covering certificate foal return in to me/Hispano-Árabe UK if you want that foal inscribed into the Stud Book for the Hispano-Árabe breed. Your covering certificate may have been issued from either the AHS/Arabian or BAPSH/ANCCE PRE Stud Books depending upon the stallion involved. If you return the foal notice to either of these Breed Societies your foal can only be registered by them as a partbred of their breed. There is only one legal Stud Book for inscription of Hispano-Árabes and that is held by the UEGHá in Spain. Only they can issue completed passport documentation validating a horse as a Hispano-Árabe and inscribing it into the Stud Book for that breed. The authority to do this has never been delegated to either the AHS or BAPSH or any other organisation. In the UK requests for this service to be applied for from the UEGHá are processed and forwarded through Hispano-Árabe UK. You can after correct Stud Book inscription dual register your Hispano-Árabe as a partbred Arabian or partbred PRE or better still a Sports Horse! But first and foremost please get it inscribed in the Stud Book for the breed! At this point in time while other countries are establishing their inclusion and recognition into the UEGHá Stud Book, but not as yet able to establish an agent/representative within their own country, Hispano-Árabe UK has extended its service to aid in facilitating inscription of foals by breeders from foreign countries. The UEGHá at a formal level has officially recognised the USA into the Hispano-Árabe Stud Book and marked the inclusion of America with the inscription of the first ever American bred Hispano-Árabe to be included into the breed Stud Book. "REAL ROMANCE" (pronounced "Re-al Ro-man-say" in Spanish and meaning "Regal Romance") was bred by Kathy and Ken Towery and foaled at their Stud in New Mexico: Rococo Sport Horses formerly Romance Arabians, last Easter Sunday 2011. REAL's sire is the black PRE stallion CONQUISTADOR Xll and his dam a black purebred Arabian mare; Virginia City A. This stunning little colt carrying the prestige of America as the flagship for USA Hispano-Árabe breeding has been purchased by Nicole Hill of Suspension Sports Horse in Texas and we wish them all success for their future together. If there are any 2012 Hispano-Árabe foals whose owners are interested in applying for inscription of their foal into the Spanish Stud Book for the breed, please get in touch with me/Hispano-Árabe UK. For now I will act as agent for the USA and Canada to ensure you submit the correct documentation for your horses to be inscribed by the UEGHá. I am working with two lovely ladies; Nicole Hill in Texas (Suspension Sporthorses, txhorse_83@yahoo.com ) and Debbie Ewing in Canada(Lucero Hispano-Árabes , pdsre@telus.net ) to establish them as the future agents working together to represent both the USA and Canada. While they familiarise themselves with the protocols and procedures, and establish contact with any necessary associations or breeders to ensure the establishment of a permanent organisation for the Hispano-Árabe breeders/owners of USA and Canadian bred stock; all applications I handle will be copied through to these ladies to help train and familiarise them with the inscription process. In the meantime we would like to gauge the interest and put breeders in touch with both ladies so that you can all be part of development of your future Hispano-Árabe association as well as for each of you to help spread the word to other interested breeder/ owners of Hispano-Árabe horses.